Back by Popular Demand!!! 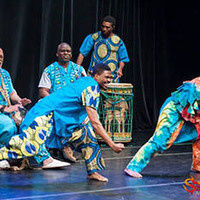 This explosive troupe of dancers and drummers are dedicated to sharing the richness of African American culture by delving into the rhythms and roots of the homelands for new generations and diverse audiences. They will move you—with chest pounding drum foot stomping dance and an infectious joy that captures and holds heart and spirit...out of Africa living on in America.